Green nail art with BP107 stamping plate | Light Your Nails! In my last blog post I showed you Italian nail polish Astra myLaque n. 38 Precious Green and here comes a nail art using it as a base. I stamped over it with green stamping polish no. 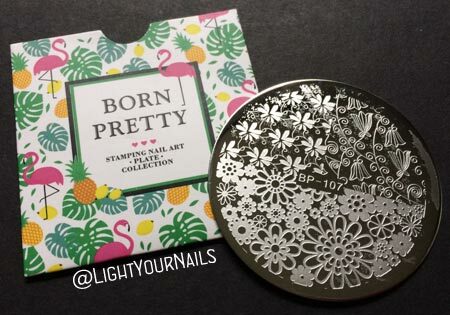 18* from Bornprettystore and BP107 stamping plate*. Both items are available on BornPretty and its German version Nurbesten.de. As you can see I went for a floral pattern. I am not ready for holidays manis yet! Nell’ultimo post vi ho mostrato lo smalto Astra myLaque n. 38 Precious Green, e oggi arriva una nail art che ha proprio lui come base. 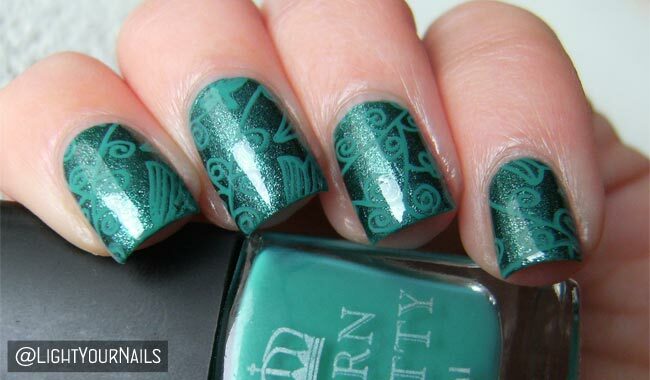 Ci ho stampato sopra con lo smalto verde da stamping n. 18* di Bornprettystore e il dischetto BP107*, anch’esso disponibile su BornPretty, o in alternativa su Nurbesten.de. Come vedete ho scelto un motivo floreale, e non qualcosa di natalizio, ancora non sono pronta per le feste! As you can see by yourself stamping is very clean and it transferred well on the nail. Both the plate and the stamping polish work perfectly. I am always very happy with this web store’s products. I am very satisfied by this nail art, I really like it, plus it’s monochromatic and I love that. What do you think? Do you like it, too? Come potete vedere la stampa è nitida e ben trasferita sull’unghia. Devo dire che sia il dischetto sia lo smalto fanno il loro dovere alla perfezione. Sono sempre molto contenta dei prodotti di questo webstore. Insomma, io sono soddisfatta di questa nail art, mi piace davvero molto, anche perchè ho un debole per le nail art monocromatiche. Voi cosa ne dite? Vi piace? I think it's the sleeves for plates from #100 onwards? It's pretty indeed! Io ho usato quello dorato di BPS e son rimasta davvero positiva, leggermente traslucido, perché metalizzato ma è molto bello. Ho il dorato della serie da 15ml e mi piace un sacco! wow this is really so beautiful and it is done very properly ! Unfortunately, i am very good at stamping :( i think i should o more practice ! Such a pretty floral plate. Great mani! I havent even begun to think about holiday manicures yet... This polish stamped really well and you did a wonderful review. This color pairing is beautiful!! That plate may be small, but you can definitely have some fun with it! Definitely! I love the patterns! Wow. Your blog looks fab! Thank you Nichole! I did a little bit of a new look, still have to do some minor changes but I like it. Oh, this is so pretty :) Perfect tone on tone stamping! I love when monochromatic stamping is so classy and subtle. Oh wow, I love how simple but unique this is! Gorgeous! Wow that stamping looks beautiful over the base! Surprisingly this year I'm ready for Christmas lol. I love how this tone on tone stamping turned out! Thank you! I did my first festive mani today. I can say I am definitely ready now!